Finally, to update this plan twice a year and submit the updates to the Committee. The bill would require the Department of Homeland Security to report back to Congress on their progress 180 days after the law is enacted. This bill, in my opinion, represents the absolute minimum necessary action that the DHS needs to take. There have been several attempts by a bi-partisan group of House Representatives to do something about the threats to the power grid prior to this – all the previous attempts in previous sessions of Congress have died in committee. Presently, there are two active bills before the house. This one and the more comprehensive H.R. 2417 Secure High-voltage Infrastructure for Electricity from Lethal Damage (SHIELD Act), which was introduced (and referred to committee) on June 18, 2013. Finally, Most Americans are unaware that tens of millions of Americans will die if the electric grid goes down for a long period of time – a frighteningly plausible scenario. But these threats and consequences are real and well documented by the federal government (see the reports here). 1) Tell your House Representatives to support these two bills: H.R. 2417 Secure High-voltage Infrastructure for Electricity from Lethal Damage (SHIELD Act), 113th Congress (introduced June 18, 2013) and H.R. 3410 To amend the Homeland Security Act of 2002 to secure critical infrastructure against electromagnetic pulses, and for other purposes. 113th Congress (October 30, 2013). 2) Tell your state legislature to look at what the State of Maine has done to protect their infrastructure and follow suit. The State of Maine is the only state thus far to take the matter into their own hands by passing LD 131. 3) Don’t wait for the federal government to act – prepare your town in the manner described by House Resolution 762 – 112th Congress. 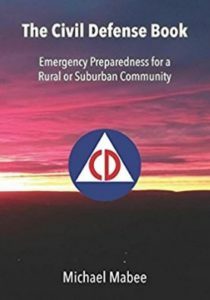 Nobody is coming to help your town in a national catastrophe – your town will need to help itself. It is time that we citizens demand action on these threats to our very existence.